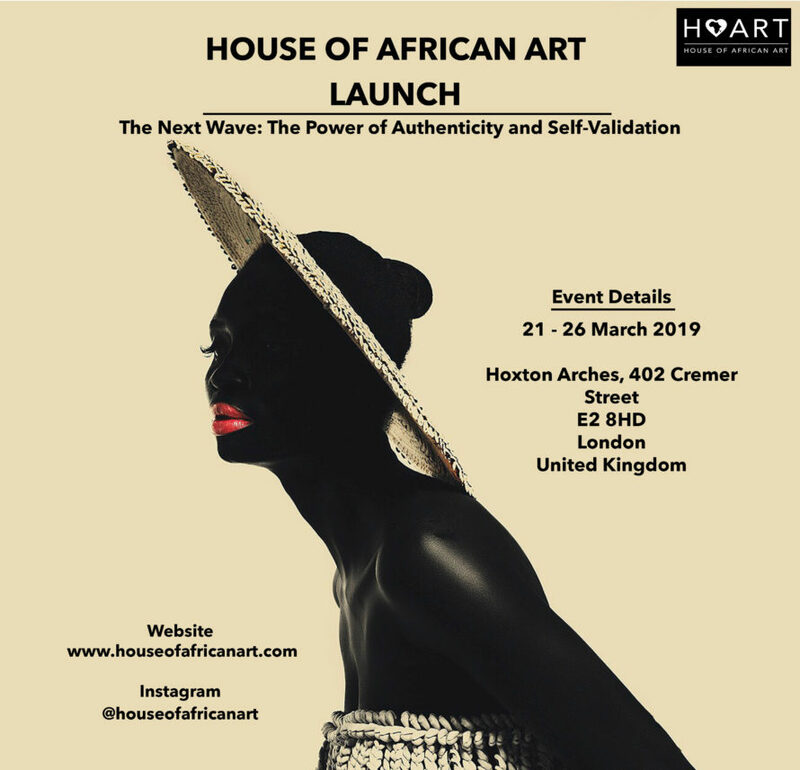 We are excited to announce that the launch for the House of African Art (HAART) will take place between Thursday, 21 March – Tuesday, 26 March 2019 at Hoxton Arches, 402 Cremer Street, London, E2 8HD. The launch will exhibit artwork from our first line up of artists, have artist talks, a spoken word performance and a DJ playing the smoothest soul, jazz and Afrobeats. Exhibiting artists are: Ayesha Feisal, Àsìkò, Kojo Marfo, Aurélia Durand, John Madu and Emmanuel Unaji. Each artist has produced new – or otherwise unseen – artwork for the launch. Thursday 21 March (OPENING DAY): the gallery will open from 10am until 6pm for previews. From 6pm until 11pm there will be artist talks, music and a welcome speech. Friday 22 & Saturday 23 March: the gallery will be open to the public from 10am until 6pm each day. On Friday, there will be a spoken word performance by JJ Soulx at 8pm, with music from 6pm until 11pm. The final DJ set will be on Saturday evening, from 6pm until 11pm. Sunday 24 – Tuesday 26 March: the gallery will be open to the public from 10am until 8pm each day. On Tuesday, the last day, we will close at 2pm. Tickets for the evening events on Thursday, Friday and Saturday are now FULLY BOOKED. Names will be checked at the door and you are encouraged to arrive early. Entry to the gallery during the daytimes is open to the public and will not require a ticket. For all artwork or other enquiries, please email us at: info@houseofafricanart.com. Àsìkò is a visual artist who expresses his ideas through the medium of photography and mixed media. He was born in London, England, spending his formative years in Lagos, Nigeria and adolescence in London. His work is constructed in the narrative that straddles fantasy and reality as a response to his experiences of identity, culture and heritage. Aurélia Durand is an Ivorian-French graphic artist based in Copenhagen, Denmark. Her upbringing in Réunion Island shaped her interests in representing the power and beauty of multi-culturalism. Her varied cultural background compelled Durand to produce art which celebrates culturally diverse and nuanced stories. Her recent works are characterised by “Afro-pop” culture, in which men and women proudly display Afro hair and braids with colourful African prints and edgy fashion accessories. John Madu is a multidisciplinary artist based in Lagos, Nigeria, whose practice includes painting, collage and design. Many of Madu’s paintings experiment with with fierce brushstrokes of contrasting, often non-realistic colours for his characters. Inspired by pop culture, African contemporary art and surrealism, Madu often paints metaphorical subjects drawing on literature, myths, and his own life experiences. Kojo Marfo is a Ghanaian artist based in London inspired by an upbringing surrounded by traditional African artifacts. His vibrant works juxtapose visions from his childhood with a current narrative, as a part of his constant drive to grow and evolve authentically. His work has been exhibited internationally in Paris, Tokyo, Amsterdam, New York, Barcelona, and London. Emmanuel Unaji is a multimedia artist of Nigerian origin, based in London. Combining painting, drawing, collage and fashion design, Unaji’s style is rebellious and bold. Inspired by the fashion industry, Unaji frequently uses fragments of magazine photographs to which he adds painted, drawn or sculpted elements. Blurring the boundaries between fine art and fashion design, he combines mixed media works with other practices to create wearable art in addition to traditional paintings and portraits.